Let’s say you sell shoes online to women. Getting paid is relatively simple and straightforward. At checkout, your customer pulls out their credit card, enters in a few numbers, and done. The payment processor authorizes the card, and funds show up in your bank account. But if you sold shoes online to retailers and not to end users themselves – in other words B2B? Who, at that retailer, will be your buyer? Do they have purchasing approval on their own, or do they need to get it from someone else at their company? What if they don’t have a corporate card and don’t want to use a personal card? Can they pay by check? What about getting 30 days worth of credit? This chapter will discuss an important, but often overlooked, aspect of B2B eCommerce: getting paid in a safe, efficient manner when payment isn’t as simple as running a credit card. We’ll discuss some of the challenges merchants face and what they can do to handle more complex, B2B payment scenarios. Getting paid is the ultimate reward for fulfilling the needs of your customer. Unfortunately, for 100’s of years, doing businesses with other businesses has rarely been a painless experience! Numerous hurdles often get in the way of a simple financial transaction due to the added complexities businesses face – namely, cash flow and dispersed spending control. These two issues remain at the core of many common B2B payment practices today. Traditional accounts receivable offices are built to handle many of these complexities. But as you move your business online, it can be difficult to transition the “old” ways of handling payments and receivables into a more efficient process that matches the efficiency of your eCommerce platform. At best, these practices delay the purchase being made. At worse, merchants experience significant cart abandonment and a lack of visibility into who is making the buying decision – a valuable insight for product upsells and business model expansion. POs are another form of control instituted to make sure people are buying the right things at the agreed upon price. It’s a bit like needing purchasing approval, but typically carries a bit more detail on the transaction along with a PO #. The purchase order number is generated by the buyer (typically out of some ERP or accounting software package). For example, when an order is received by the buyers company, the PO# is included on the invoice so it can be matched to the original PO document to ensure that the customer received the order. PO numbers also help accounts payable pay the right vendors the right amounts. So how do buyers get the POs to sellers during or after they check out online? The answer, unfortunately, is via email or a fax machine. This offline meets online transaction truly defeats the efficiency of eCommerce and causes a myriad of accounts receivable issues for online sellers. Often, a workaround solution can be a simple text field with a PO # in it. Assuming your customer is already set up on a corporate account, this may be an adequate solution for them. If their PO is requesting individual terms or they are a new customer, just letting them enter in the # isn’t enough. You’ll want to see more information before accepting their terms. To develop a long-term, trusting relationship with your customer, setting them up on a corporate account is a step in the right direction. A corporate account creates a stronger bond between you and your customer and often implies an added layer of trust and hopefully, reduces customer churn and their interest to shop with another vendor. Corporate accounts should make checking out online simple and easy and make repeat purchases a snap. You may want to allow customers to set up multiple individuals as approved shoppers or give them pre-approved spending limits. Corporate accounts often imply a much more streamlined billing experience as well. Often, merchants can issue a “Blanket PO” where they consolidate invoices for individual purchases and present the customer with a single bill at the end of the month. So why don’t more B2B eCommerce sites offer corporate accounts? Many merchants don’t have the eCommerce or A/R software to accommodate corporate accounts. “Rolling their own” is too complex. For example, most eCommerce platforms need a form of payment before the buyer completes checkout. If you want to allow your customers to pay at the end of the month, how do you make that happen? Getting paid is also very manual. Invoice consolidation and payment collection happen in a very traditional way mailing or emailing invoices for payment. Offering credit to your business customer goes hand-in-hand with corporate accounts. Companies have been offering one another credit terms (New 30? Net 60?) for a long time. Do you think your customer’s expectations are about to change since you moved your product catalog online? Hardly. Giving your customer a bit of leeway on payment helps them manage cash flow, but it can hurt you just as quickly. Giving a customer credit involves receiving a credit application to help measure their risk profile. Even at multi-billion dollar companies, this process more than likely still involves a fax machine. A fax machine. As we previously mentioned, most eCommerce platforms ask for some form of payment during checkout. How can you offer credit to a customer and still give them the eCommerce buying experience they expect? What about tracking down payments? Do you have a system to help automate this process or are you stuck manually setting up schedules with reminders to manually send emails and make phone calls to get paid? There were about 20 billion checks written in the US in 2013. Of those, about 6 billion were B2B related (WSJ). Logic would seem to say that there is no way someone would try to pay for an online transaction with a paper check, right? Wrong. Various industries still cling to checks due their ease of use and inherent control. Education, legal, medical, government, and numerous others. Unlike handing out corporate cards to every employee, there is often a single checkbook controlled by one person at a company. If that is the way your customer prefers to pay you, should you turn it away? Unless you are prepared, handling checks can cause a number of issues as it relates to eCommerce. Once you receive a check, how do you quickly mark an online transaction as being paid? The US Mail. Enough said. Those checks have to end up in a bank sometimes. Who’s going to drive them there? More than likely, it’s going to be you. There are many things to think through to make the “last mile” of closing an online sale easy for your customer and your organization. There are a few options out there that might be worth looking into. all riffs on very traditional accounts receivable processes and involve numerous “off-line” headaches involving time, labor, paper, and money. To become more efficient, implementing the right B2B eCommerce solutions needs to automate many of the processes we’ve discussed. There are existing platforms that are making headway in B2B payments like Stripe and Paypal. Let me discuss the Apruve platform, because they are a startup doing interesting things by reinventing the B2B eCommerce payments field. Apruve is tackling the complex challenges of B2B payment in a unique way. 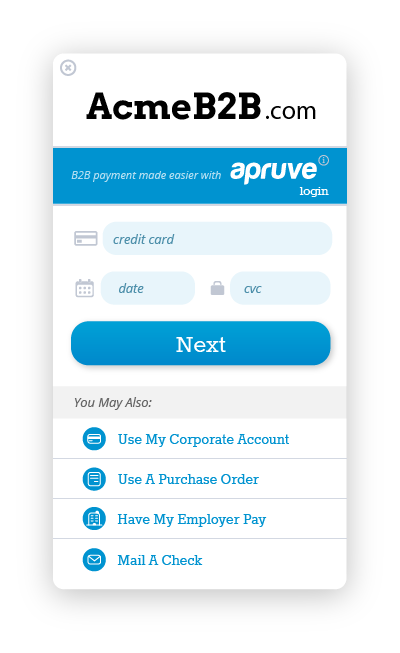 Apruve lets you handle numerous forms of payment from cards, to ACH to paper checks, all through their payment platform. See my interview with co-founder, Michael Noble for more info.